NØUK VHF/UHF/SHF Amateur Radio Page. Ping Jockeys do it 'til they HEAR the burn! Following this link will take you to a brief description of my station.Included are maps showing the grid squares worked from this station. The maps are colour coded; blue blocks indicate those squares simply worked, whilst red blocks signify QSL card acknowledgement. The maps are regenerated each night. Here you can find a number of VHF,UHF, and SHF contest log entries. Currently, they are all for N0UK and/or the Eleventh Hour Contest Group, but anyone may sent me their logs and they will be included. and here's one taken during the second leg of the ARRL 10GHz and Up Cumulative in September 2000. VHF, UHF, & Microwave topics. Sources of equipment for VHF DX equipment. Down East Microwave manufacture and sell a wide range of prebuilt and kit form equipment and accessories. Their quality of design and support is super. G3SEK's amateur radio technical notebook. N.E.W.S. (North East Weak Signal Society) home page. 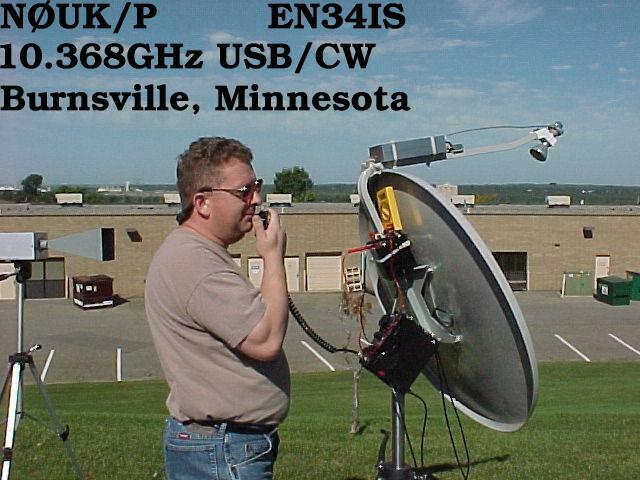 In 1996, the Central States VHF Convention was hosted by the Northern Lights Radio Society , in Bloomington, Minnesota. It returns again this year (2006) to the very same venue. Details about the event can be found on the preceding web page. Courtesy of AMSAT-NA, a Maidenhead Grid Locator Converter! Enter decimal degrees or degrees/minutes/seconds. Updated 18 October 2002. Feedback to KB5MU. This is a graph depicting the temperature/dewpoint gradient of the lower atmosphere, as sounded by the National Weather Service in the Twin Cities. It may be of use to those interested in predicting the existence of tropospheric enhancement to VHF and UHF radio signals. Attendees at the 1997 Aurora conference of the Northern Lights Radio Society will recall the excellent presentation that discussed the usefulness of these graphs in predicting band enhancements. is owned by Chris Cox, N0UK/G4JEC.